Niels Feijen of the Netherlands won his first world title - and the first for his homeland - at the Predator 14.1 Straight Pool Championships, but two interlopers almost stole the spotlight. Feijen started strong and never let up, finishing undefeated in the three-stage format. Niels Feijen is exciting to watch when he's on. His bridge is longer and his grip lower than many; his sense of fluidity and pace are better than most. Like many 9-ball converts to straight pool, he plays what experts call the "power game," and prefers to send his cue ball through the stack rather than off it. He has the stroke to do just that, too; his break shots sound like a wrecking ball is involved. 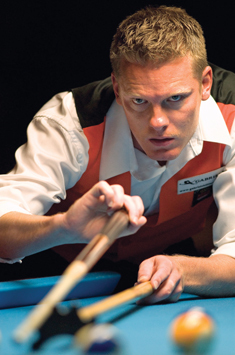 Feijen's opponent in the final of the 2008 Predator World 14.1 Straight Pool Championships knew a thing or two about breaking the balls as well - also in another game. 9-Ball colossus Francisco Bustamante, the only Filipino entry and a last-minute replacement at that, drew much of the attention all week despite being the least experienced straight-pool player in the field. The famous glower and serpentine stroke were definitely in place, but it was pretty clear he was feeling his way. "He doesn't play bad," offered Hall-of-Famer Mike Sigel, somewhat unnecessarily, "but he's got a lot to learn." The Championships, produced by Dragon Promotions on Aug. 25-30 at the East Brunswick (N.J.) Hilton, was certainly a bona fide world-class event from a roster standpoint. Twelve of the 16 seeds were foreign-born. No other tournament duplicates this rigorous format: Eight groups of eight players each compete at round-robin play to 100 points; the top four from each group then advance to double-elimination competition, 150 points; and for the final 16, it's single-elimination to 200 points to determine the winner. But the quality of play was so uneven as to verge on schizoid. "The balls," opined former 14.1 world champion Bobby Hunter, "seem to have been polished with hairspray." Indeed, object balls could be seen skidding like bald tires in a typhoon on all eight tables. At the beginning of the week, when the room was still dry, play began promisingly; there were 100-ball runs by 2006 champion Thorsten Hohmann of Germany and America's Corey Deuel. But as the humidity grew, play fell off visibly, and all through the room, observant fans could see the signs: players short-arming strokes, palms and eyes turned to heaven in helplessness (especially Sigel, three to four times a rack), and the little half-squats as players empathically tried to coax an object ball past a nasty pocket jaw. The only four players to come through the round-robin stage with spotless records were Feijen, his countryman Nick Van den Berg, Finland's Mika Immonen, and America's 9-ball giant Johnny Archer. Bustamante sailed through with only one surprise loss, to the USA's Dan Howard. Several opponents seemed intimidated by his nationality alone.